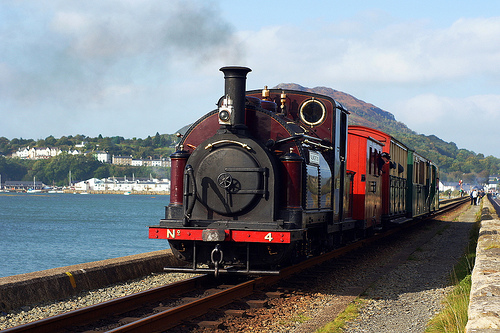 Porthmadog lies on the edge of one of the most stunning areas in Wales, and is known as the gateway to Snowdonia. The town is a thriving place with lots of shops, restaurants and cafes. It also has a rich historical heritage and a strong, Welsh identity. The majestic mountains of Snowdonia overlook Porthmadog and to the north and east, the beautiful Glaslyn estuary snakes into the sea. The town of Porthmadog was once an important seaport. The famous ‘Cob’ was built to reclaim the sea and create a natural harbour deep enough to accommodate great sailing ships in the 19th century. It also carried the railway, which became an important part of Porthmadog’s slate mining heritage. Today Porthmadog is no longer a busy seaport and the slate mining industry has significantly declined, but it remains a popular place to visit, particularly for railway enthusiasts. There are no less than three railway lines operating out of the town, including the famous narrow gauge Ffestiniog Railway, which runs all the way up to Blaenau Ffestiniog. The Welsh Highland Railway, another narrow gauge railway, takes passengers via the scenic route to Caernarfon, while the West Highland Heritage takes you on a short trip to the engine sheds, where you will learn more about locomotives and how they work. Porthmadog may no longer accommodate large ships, but there are still plenty of yachts and pleasure boats to be seen in the harbour and the waterfront is a great place to stop and watch the world go by on a warm sunny day. The Maritime Museum is located on Oakley Wharf, beside the harbour. Here you can learn more about the town’s maritime past, including the story of the Gestiana, the last ship to be built in Porthmadog ship yard, which was lost at sea on its maiden voyage. Grisiau Mawr is the Big Steps from the harbour up the hill to Y Garth. They are believed to have been constructed in the 1800s and if you walk right up to the top, you can enjoy some glorious views over the harbour, the estuary, and towards Snowdonia. Art lovers should visit the Rob Piercy Gallery on Snowdon Street. The gallery exhibits Piercy original artwork and prints, plus a selection of works by other local artists. And if you want to catch a movie while you are visiting the town, check out the charmingly old-fashioned Coliseum Cinema with its wonderful original features. Nearby Black Rock Beach is a fine stretch of sand dominated by a picturesque headland. There are caves to explore at low tide and lots of rock pools where kids can go looking for crabs. The sand dunes are designated an area of ‘Special Scientific Interest’. A visit to Porthmadog would not be complete without a side trip to nearby Portmeirion village, designed by architect Clough Williams- Ellis and famous for being the setting of the 1960s series, The Prisoner. Craft ale fans should also make time to visit the Purple Moose Brewery, where you can take a tour of the brewery and sample the beers.